Gengetsu Hozuki is the Second Mizukage from the Hozuki Clan. Even Mangetsu Hozuki and Suigetsu Hozuki is from the same clan. Hozuki the Second Mizukage died while battling Mu the Second Tsuchikage due to their mutual enmity. He was reincarnated using Edo Tensei during the Fourth Shinobi World War. Gengetsu gave a huge battle during the war and was sealed away by Gaara. Let’s take a look at Gengetsu Hozuki[Second Mizukage]. Taijutsu & Ninjutsu Water Style – Ice Darts Jutsu[Prompt]: Causes heavy Water attibute damage to a selected unit, also causes the unit to suffer from Knockdown and Ignition. Every time this unit’s Standard Attack triggers 10 COMBO, his Mystery Skill’s Cooling Time will be reduced 1. Taijutsu & Ninjutsu Water Gun Jutsu: Attacks the opponent’s units in the fron row and has fixed chance of causing 10 COMBO and Repulse. Ninjutsu Water Gun Jutsu-Chase: Chases and Attacks a Repulsed unit, causes Knockdown. Ninjutsu Steaming Danger Tyranny Boy: Before each action in a round, summons 1 Water Clone. It will explode when it launches a Standard Attack, will cause damage to 3 of the opponent’s units will cause Tag to these units. Ninjutsu Water Ball Discharge: If there is 1 Edo Tensei type unit in your team, this unit will have its Ninjutsu increased by 4% and his Combo Rate increased by 8%. 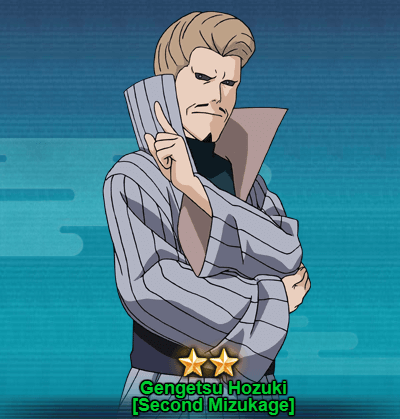 You will only receive 2 star ninja of Gengetsu Hozuki[Second Mizukage]. You can draw him from the Edo Tensei treasure within 30-40 seal scrolls or Great Ninja War (GNW) treasure in 10-20 seal scrolls draw.